Queens Removals proudly offers home and office removals in Woking at low cost without compromising on service. Whether you're moving from a studio flat or a mansion, our experts will assess your requirements. We'll provide you with a free, no-obligation quotation. Queens Removals employ specialist removals men to take care of your piano, fine art and antiques. Woking is a town that shares its name with the surrounding local government district, located in the northwest of Surrey. Woking town has a population of 62,796. Woking's earliest written appearance is in the Domesday book and mentioned as the site of a 8th-Century monastery. The Hoe Valley Scheme was a housing project to relocate Woking homes away from the flood plain of the Hoe stream. The Woking borough council had planned this scheme for 20 years. 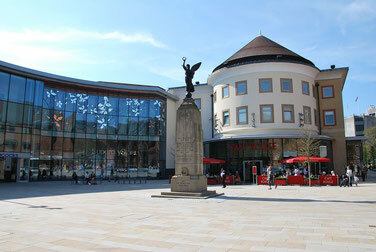 Woking is home to an arts & heritage centre at The Lightbox. The Lightbox contains many hands hanging from the ceiling, a brief history of Woking and many other exhibitions.